THE WORLD’S largest gasoline container, located in Chicago, Ill, serves a dual purpose. In addition to having a capacity of 20,000,000 cubic feet of gas, it is also the first comparable industrial structure in the country to be marked and lighted according to specifications approved by federal and local aviation authorities. 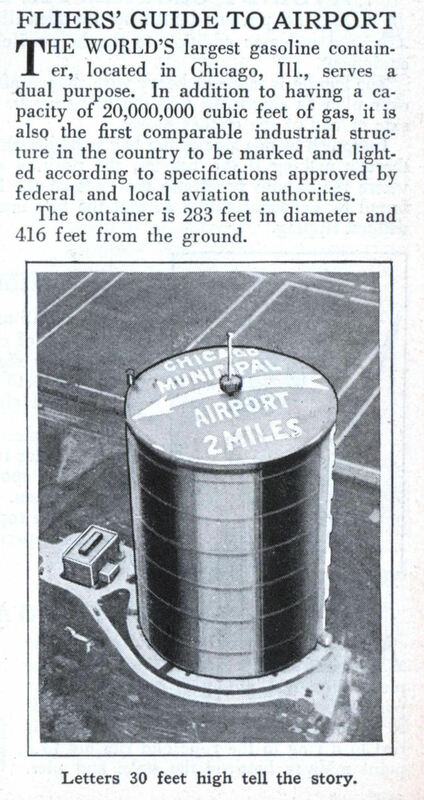 The container is 283 feet in diameter and 416 feet from the ground. That’s a pretty large gasoline tank. Not a good thing to hit, especially if it was only partly full. You’d think they’d be more fire aware in Chicago.